The second largest island in Thailand, Koh Chang is the main island in a large archipelago stretching off the east coast of Thailand, close to mysterious Cambodia. It offers a unique combination of dramatic wild island scenery with excellent accommodation standards. 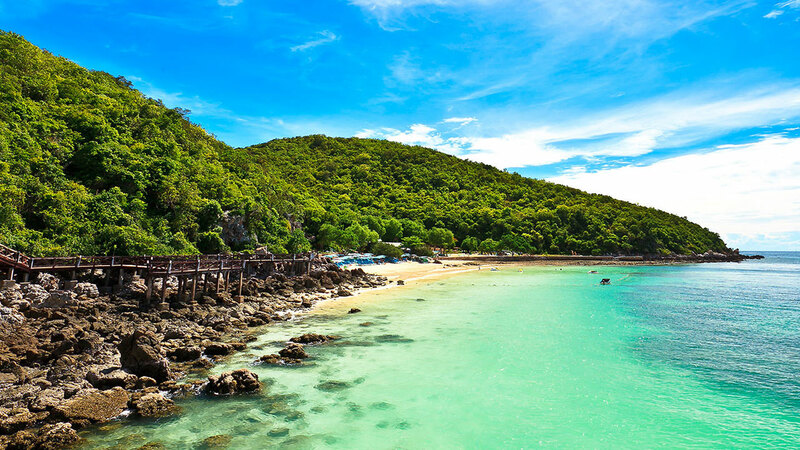 It’s a nature lover delight, activities range from diving, sailing and hiking to relaxing spas, sauna and traditional massages overlooking magnificent sea views over the Gulf of Thailand. If you are planning to get married or renew your vows and you are worried about the cost of a large event to which all your relatives must be invited, or if you are already married and wish to crown your honeymoon with a very special memory. The perfect setting to make your dream beach, garden, island or sunset wedding and tropical honeymoon come true with Thailand’s leading specialists in romantic destination weddings. Buddhist Blessing Ceremony : Have a traditional Thai wedding in one of Koh Chang’s Buddhist Temple and be blessed with good luck, good love and good life by the monks. Pre Wedding Packages : Many places in Koh Chang offer amazing view and location for the perfect background for your photos. Extraordinary service with the super professional team of photographers will make your Pre Wedding Photo Shoot day an unforgettable one.